There are a lot of varied opinions out there when it comes to heavy strength training for endurance athletes. Between all the training runs, pool sessions and long bike rides, it’s hard to make time for an extra workout in the gym. But even when you do have time, are you getting the most out of your workout in the gym? Your typical endurance athlete will mainly focus on high repetition movements with a light weight on each exercise. Conventional wisdom tells us that this increases muscular endurance and is the best option for endurance athletes. I digress. Put me in the corner of you believing that athletes should use their time in the gym to focus on aspects that you can’t improve when running or cycling. Lifting for building power and strength. If you want to develop your muscular endurance, run or cycle further. Use the time in the gym to focus on traits that endurance racing can’t provide. According to Men’s Fitness personal trainer, Jeremy DuVall, “The ability to produce quick, forceful muscle contractions is crucial for maintaining efficient form and remaining injury free. Each time your foot hits the ground when running, you’re forced to absorb on average about 2.9 times your bodyweight in force and then explode off the ground for the next stride”. If you’re looking to increase your distance or speed, you’re increasing the load on your body and therefore exposing yourself to a greater risk of injury. Strength training is not only a great way to offset this risk, but also improve your performance as well. When it comes to training for endurance, it’s really easy to get caught up in the endless cycle of swimming, cycling and running. We tend to neglect the stuff that actually keeps our bodies able to perform when pursuing a specific goal. So while you don’t need to spend all your time pushing or pulling big weight, you simply can’t turn your head away when it comes preparing your body adequately for the toll of endurance training. What kind of endurance athlete are you? Before you get into any strength program, you need to be realistic about what you can actually achieve because endurance training as you know, is demanding. 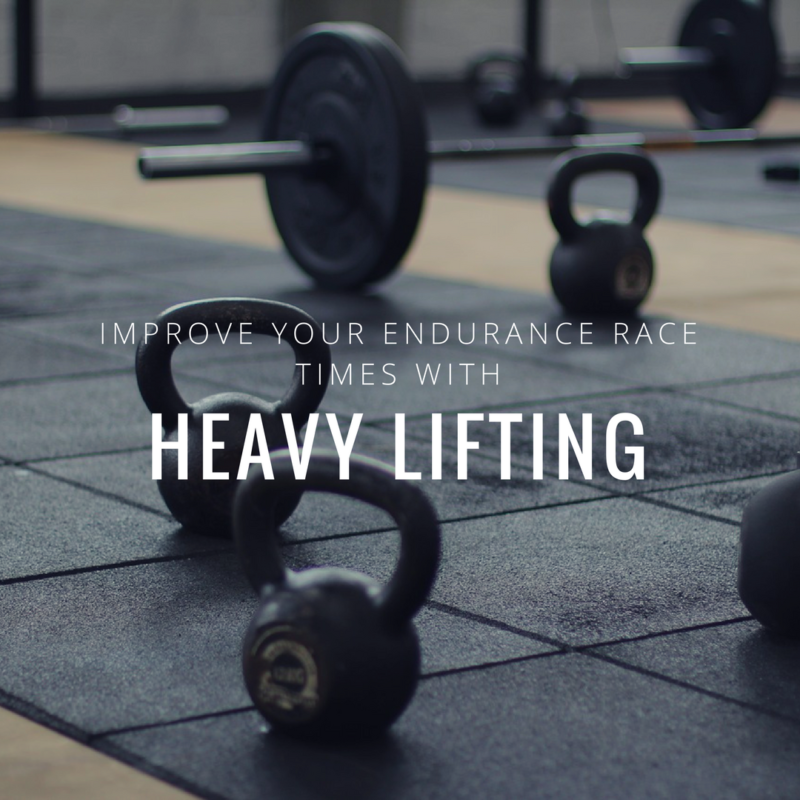 If you’re racing to stay fit, healthy or loose pounds, heavy strength training could be the perfect complement to help you improve your performance and reach your goals. You should be able to incorporate a strength program right away and start seeing results early. For a competitive racer, it gets a little trickier. You’re going to need to find a timetable to train that doesn’t affect your endurance schedule. Doing 10 miles a day after a heavy day of squats is never easy. This doesn’t mean you can’t do it, you’ll just need to incorporate strength training when you aren’t in a heavy training week that involves lots of miles. The offseason is the best place to start if you haven’t already. Before you say it, no, doing heavy strength work will not leave you looking like the hulk. And that’s not the goal either. Large muscles take up more oxygen, water and heat, which is the opposite of what an endurance athlete wants. Science lesson incoming, muscle mass is not directly related to strength. The reason for this lies in the relationship between the nerves, the muscle and something called the motor unit. According to AMAC, a motor unit is defined as a nerve and all the muscle fibres stimulated by that nerve. According to Ben Greenfield, “It doesn’t take much of a signal to recruit slow-twitch or endurance muscle fibres in a motor unit. It takes a stronger signal to recruit fast-twitch or explosive muscle fibres. However, the goal of weight training and strength building is not to increase the signal to the fibres, but rather to train the body to be able to recruit multiple motor units”. Ben concludes, “As an endurance athlete, you can have a relatively small number of motor units, but with proper training, can gain the ability to recruit a significant number of those motor units simultaneously”. You don’t need mounds of muscle mass, but only the ability to be able to wholly recruit the muscles that you do have. What kind of lifting should I do? Finally, the fun part! Endurance racing is a multi-joint/muscle activity so the training you do should reflect that. I’m a big fan of large, multi-joint, compound exercises. These exercises target functional movements that we do in real life: bending down, pushing and pulling things, and picking things up. Too many endurance athletes focus on the small, supporting muscles that they tend to have imbalances in. And whilst they may be key to the sport that they compete in, I can think of many ways of better using your time than spending 30 minutes focused on your rotator cuffs in the gym. Injuries aside, why spend so long isolating a specific muscle group when you can work more with greater added benefit? Still use isolation & bodyweight exercises to focus on your imbalances and injuries that you may need to work on, but make up the bulk of you work with heavier, compound lifts. There’s plenty of material out there on the internet in terms of an actual workout plan, but ultimately it will come down to what you can fit into your schedule and what your race calendar looks like. Try and do the bulk of your heavy work in the offseason. If you’re stuck on where to start, 5 x 5 lifting is a great place. So hopefully we have given you a few reasons to change up your training routine to incorporate weight training. Bear in mind, there are always two sides to every story, especially one as subjective as training. Some athletes don’t do any weight/strength training at all and still perform at elite levels. This neither discredits or proves the theory, it purely shows that each individual has his or her own needs.